If your outputting a list of checkboxes using CheckBoxFor from within a loop and are having problems getting the checkboxes to bind back when submitting make sure you are looping with a for loop rather than a foreach loop. 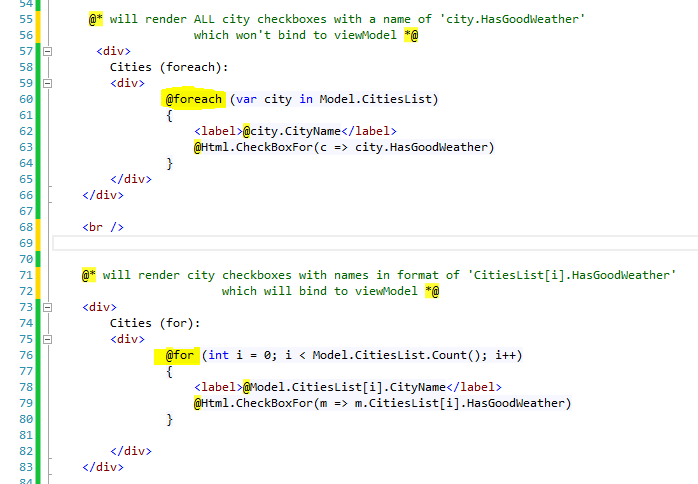 This is because looping through a collection with a foreach loop will output the same name for all checkboxes which will be based on the name of the iteration variable (not the particular item in the viewModel collection) in your foreach statement and the name of the bool property and thus MVC will not find anything to bind to. You can have multiple non nested forms all posting to different action methods from different submit buttons, you can also have multiple submit buttons posting to the same form and hence action method. In an MVC action method which is posted to by multiple submit buttons, how does one tell which button was responsible for the form post? 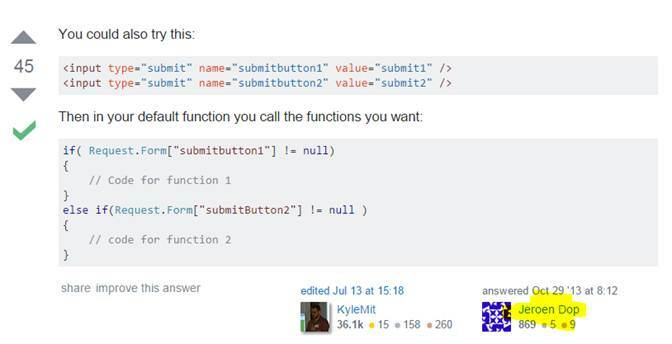 Two easy ways are outlined on stackoverflow which I’m reposting as is here just to add a bit of extra ‘commentary’. Author is highlighted in yellow. In your razor mark-up each submit button has a different name property. Since only the name of the button which caused the submit will be posted in the HTTP request header, in your action method you can check the Request.Form collection to see which submit button property name exists and take action accordingly. In this case you don’t have to change your action method signature and given that the value property of your submit buttons is insignificant to determining which button was pressed, all your submit buttons can have the same label/text if needs be. In your razor mark-up each submit button has the same property name but different value, since only the name (and significantly value) of the button which caused the submit will be posted in the HTTP request header, you can add a property to your action method signature for MVC to bind to and populate. You can then check the value of that property and take action accordingly. This is the more MVC (and perhaps elegant) way I guess as your using default model binder rather than checking form collections directly, personally however I prefer the approach above as you don’t have to change the action method signature and the button test is not based on some visible on page property which could matter in some scenarios. 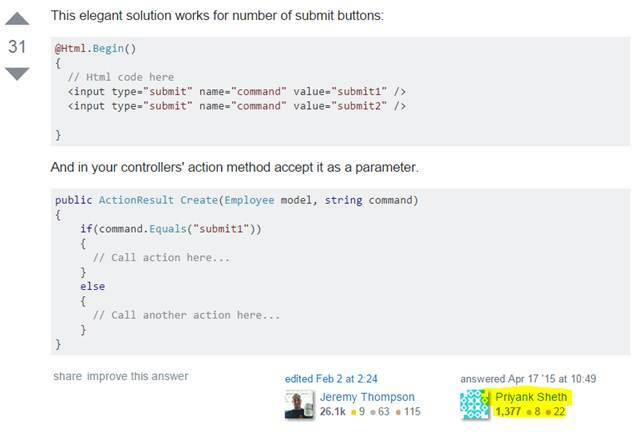 http://stackoverflow.com/questions/19650345/mvc-razor-form-with-multiple-different-submit-buttons – Stackoverflow page with a number of solutions including the two above and an AJAX based one too. 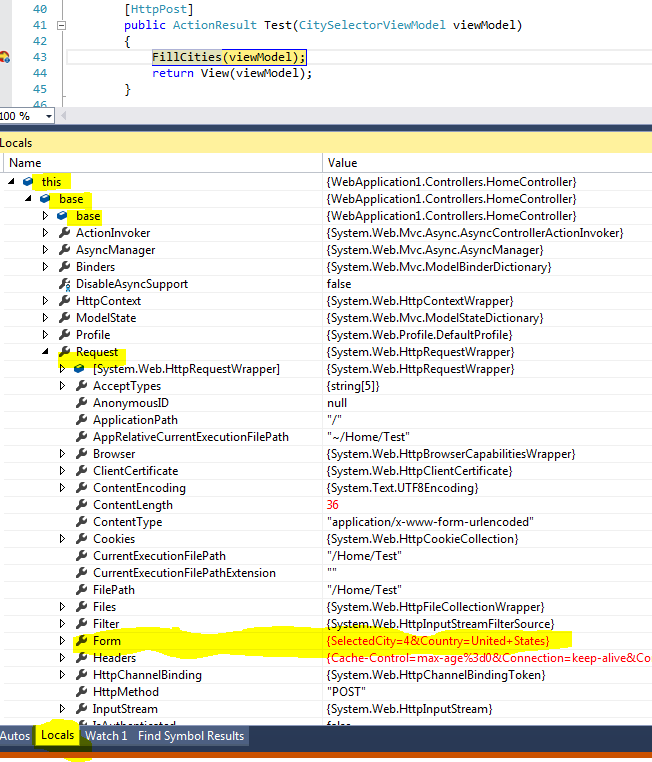 When using ASP.NET MVC sometimes after a request viewModel properties you expect to be binded and populated are not. For HTTP GET action methods debugging why this might be is easy as the params are visible in your URL. For HTTP POST requests the name/value pairs are sent in the header so they are not as easy to review.